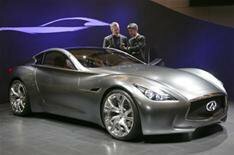 Infiniti Essence to get go-ahead | What Car? Infiniti is expected to reveal plans to build a 150,000 four-seater supercar based on the Essence concept car unveiled at the Geneva motor show in 2009. The recession saw the project mothballed, but now, an insider tells Whatcar.com, a positive decision for the future of the car is likely to be taken in the next few months. The Essence concept will be toned down for production, although judging by the striking looks of other Infiniti cars it won't be too conservative. The 600bhp petrol-electric hybrid powertrain of the concept car is unlikely to feature, from launch at least. Instead, the coupe will probably use the 478bhp 3.8-litre V6 found in the GT-R from parent company Nissan. It won't be a slouch, then, although the Essence will almost certainly be a more refined, luxurious alternative to the GT-R, in line with Infiniti's core brand identities.